Ich besann mich auf ein Flüßchen hinter der Stadt, ein seltsam schimmerndes, an manchen Tagen fast milchfarbenes Gewässer, das ich kilometerweit verfolgt habe, einen Herbst lang oder noch länger, vielleicht nur, um einmal hinauszukommen aus einem Territorium, das, wenn ich es endgültig sagen soll, von den Grenzen meiner Müdigkeit eingeschlossen war. I recalled a stream beyond the city, a strangely shimmering, on certain days almost milky, stretch of water that I followed for miles throughout a whole autumn, or even longer, perhaps just for once to escape from a territory that, to put it bluntly, was enclosed by the boundaries of my tiredness. This poetic start belies what is to follow, although the jarring tone of the ‘milchfarbenes Gewässer‘ does provide a clue. 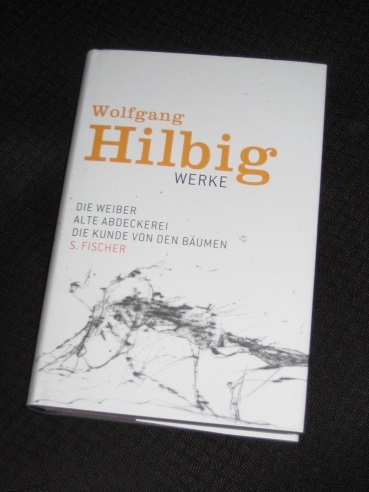 Far from being a story glorying in the beauties of nature, Alte Abdeckerei actually focuses on filth and pollution, both of the environment and the human soul, with Hilbig’s customary Ich-narrator dragging the reader down into the depths of his torment. The story can be difficult to pin down in terms of time, with the piece soaked in a deliberate fog of confusion. While many of the narrator’s stories are drawn from his childhood, this period of his life seems to stretch out for decades, with his adult self still trapped in his younger body (and clothes), wandering down the stream at several different times at once. If the reader is generally unsure as to when we are, though, the where is immediately clear, especially to those familiar with Hilbig’s work. These walks take us through the abandoned industrial complexes of the east of Germany, the ghostly playgrounds of the young writer himself. Yet despite its circular nature and the confusion occasioned by the nebulous nature of the setting, Alte Abdeckerei is actually more coherent overall than Die Weiber. Hilbig cleverly starts with his evening walk before slowly widening the scope, following the stream and gradually revealing the area’s secrets. We learn of the history of the industrial area, and the people who work there, with the narrator’s own experiences skilfully woven into this narrative, before the true heart of the story, the rendering plant itself, is finally introduced. This plant is described as a dark secret, one most people avoid, but Hilbig’s ageless narrator isn’t most people. Fascinated by a shadowy world most simply ignore, he seeks out the men who work there, outsiders who stick to their own kind, secretly longing to join the group of outcasts (this, in itself, is a nice metaphor for the writer’s feeling of being an outcast in his own country). Even when he realises what the plant does, and what is responsible for the milky-white colour of the stream (and the stench pervading the town), his desire to become a part of this community continues. While this is never explicitly stated, it’s hard, given the setting, to avoid equating much of this physical filth with the ideological rubbish the writer wishes to flee. The narrator isn’t a man who finds it easy to adapt to his society. It’s almost as if the spooky willows are about to up roots and follow us down the stream. Of course, as you will hopefully have seen from some of the extracts above, it’s the writing that truly lifts Hilbig’s work above the crowd, and the novella culminates in an astonishing few pages, full of surreal, dazzling word-play that stuns the reader and brings the whole story crashing down onto our heads (I can’t begin to imagine how it was all put into English, so well done to Fargo Cole for even attempting it!). This fairytale-like scene of a world imploding is a fitting end to a dreamlike book with a bite, an astonishing short work that will stay with any reader who reads it. Yes, Hilbig is an excellent writer, and (as that exuberant praise mentioned in my introduction shows) this is a book well worth seeking out. I am yet to read this, but “Sleep of the righteous” is an astonishing work. This, in Isabel’s translation of course, is my favourite Hilbig. I have read it possibly half a dozen times or more. I was telling someone today that I could just pick it and lose myself in it at any time, I just love the way one can get lost in it. This was a convincing review. I read Sleep of the RIghteous but did not blah blah blah. Anyway, I should read this. Having said that – “best prose written in our language for decades” – what do you think that means? Neither the book I read nor the examples you give here explain that. Tom – Ironically, whenever people write about superb prose, it’s usually because it’s more akin to poetry than prose. There’s lot of that here, with the effect coming more from the sound and rhythm of the words, along with the cicular nature of the text. It’s a little like I found with Proust, where it was hard to cut out a nice quotable chunk to illustrate the quality of the writing – it was the continuous wave of sentences that created the effect. (And, of course, the English above is my writing, not Hilbig’s! ).